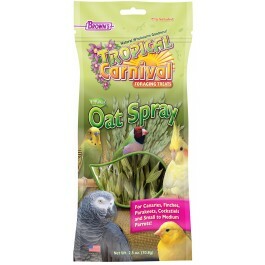 Tropical Carnival® Natural Oat Spray Foraging Treats are grown and harvested in the USA with the flavor and goodness that nature intended. Our protein-packed oats are nutritious and fun to eat. • For Canaries, Finches, Cockatiels, and Small to Medium Parrots!